Owens Electric Motor Rewinds can organise and provide a full workshop service and testing for all makes and models of generators. Our workshop can provide service from minor repairs through to complete rebuilds. 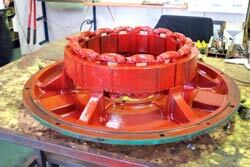 Our workshop is fully equipped to rewind generator rotors and stators from 5 KVA up to 2000 KVA. At Owens Electric Motor Rewinds we can organise for “In field” service for fast reliable response to your breakdowns or maintenance needs. We currently service generators from all over Queensland, and South Pacific. Full breakdown service and rental fleet access is available for urgent requests. On site engine servicing on a scheduled basis can be arranged and a complete engine rebuilding service is available. Load testing of generators of up to 1MW on site or in workshop is also available. 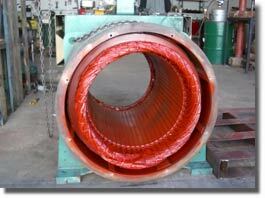 Depending on the extent of repairs required,, delivery can usually be made within one to four working days.